Passing along some news on TPS .. US Secretary of Homeland Security Jeh Johnson has extended Haiti’s designation for Temporary Protected Status (TPS) for an additional 18 months. The extended designation is effective January 23, 2016, through July 22, 2017, Caribbean News Now reports. 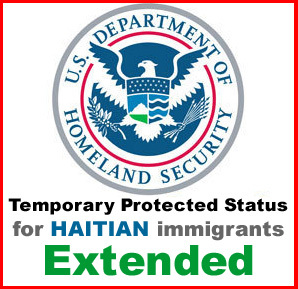 Current TPS Haiti beneficiaries seeking to extend their TPS status must re-register during a 60-day period that runs from August 25, 2015, through October 26, 2015. US Citizenship and Immigration Services (USCIS) encourages beneficiaries to re-register as soon as possible once the 60-day re-registration period begins. USCIS will not accept applications before August 25, 2015.